This page contains pictures and information about Pygmy Grasshoppers in family Tetrigidae that we found in the Brisbane area, Queensland, Australia. 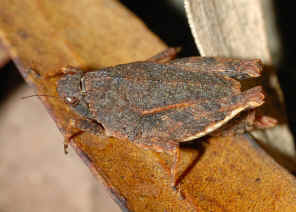 Pygmy Grasshoppers, as their name imply, are small in size. They prefer wet habitat. They may be found along watercourses, sit on mud and amongst stones along creeks. 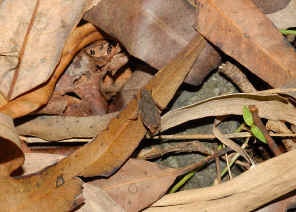 Some of them were found on rainforest floor. 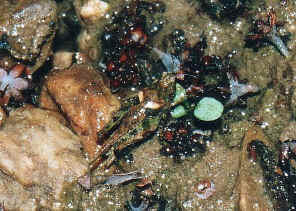 They feed on algae and vegetation. You may not see any insect in this picture. But if you watch it carefully, you should see a grasshopper in the middle. We took this picture on the water edge of a small pond at Bulimba Creek. Please check this page for more information. Pictures were taken in Ford Road Conservation Area on Jan 2009. We do not known much about this grasshopper. Please also check this page for more information. 1. Grasshopper Country - the Abundant Orthopteroid Insects of Australia, D Rentz, UNSW Press, 1996, p195.